Pioneered by HubSpot back in 2005, Inbound marketing has reinvented how brands reach their audience in a marketplace where buyer behaviour has changed. The methodology helps businesses focus on attracting the right type of customer through helpful and relevant content, adding value at every stage in the customer’s journey. The buying process has changed and it’s becoming more difficult to penetrate target markets successfully. Buyers are taking control with nearly 60% of purchase decisions now occurring before contacting a supplier. The inbound methodology helps you maximise your marketing spend, effectively increase website traffic, boost lead generation, generate sales and improve customer loyalty. Unlike interruptive traditional methods, Inbound marketing is about attracting the right type of customer to your business, pulling them towards you, instead of pushing yourself towards them. Rather than forcing your product or service on people, you make it easier for them to find you at the right time. The technique focusses heavily on content marketing, email marketing, search engine optimisation (SEO), website optimisation, lead generation and social media, to increase brand awareness and create high quality sales leads for your business. 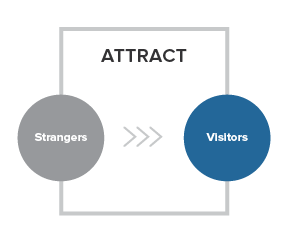 By aligning content to your prospects interests, you will naturally attract inbound traffic that you then convert, close and delight. The most important component of a fully functioning lead generation machine is the customer persona. Personas are fictional representations of your ideal customers. They encompass the various needs, goals, and observed behaviour patterns among your real and potential customers. Attracting your ideal target buyer is the first step of the buyer’s journey. Here, we revert back to buyer personas, all the content you publish should be developed around them; their pain points, goals, challenges, etc. Writing content that contains the right keywords your persona is searching for will act as a form of SEO. The more keyword-rich content you publish; the more visitors you will attract. ▫︎ Blogging - Create blogs that helps your personas with the problems they have. Answering their questions will move them through their buying process bringing them closer to buying from you. ▫︎ Social Media - Use social media channels to engage with your followers and share links to your content, encouraging them to click through to your website. ▫︎ Search Engine Optimisation (SEO) - Optimise and populate your web pages with keywords that your ideal customers are searching for. 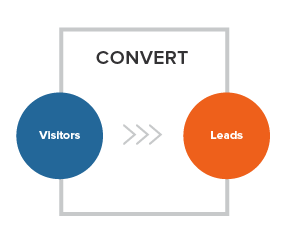 After attracting the right type of visitors to your site, the next step is to convert them into leads. To encourage people to hand over their contact details, you need to offer them something they can’t resist in return; an enticing piece of content such as an eBook or access to a white paper - something that is of high value to your persona. ▫︎ Call to actions (CTAs)- enticing buttons to engage with potential customers and encourage them to download your content offer. ▫︎ Landing Pages - After your website visitor clicks on a call to action, they will be directed to a landing page. The landing page will contain the benefits of the offer and form, where the prospect inputs information to receive the resource. ▫︎ Forms - Create forms to obtain visitor information, ensuring the form is optimised to make the process straightforward for potential customers to submit. ▫︎ Contacts - The HubSpot CRM makes it easy to keep for your sales team to keep track of all your leads and efficiently store their data. Your prospects are interested in your content and what you have to offer, now you need to focus on converting them into buying customers. Automated email workflows will bring leads from the consideration stage to the decision stage, at which point they have qualified for and are ready to meet with a member of sales. Your content team will write compelling email copy and automate email sends based on your leads actions. The content used during the close stage is created to entice leads to interact with your sales representatives, offers can include a case study, consultation invite, free trial or quote. 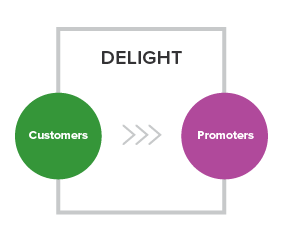 Turn your customers into promoters by exceeding their expectations to create a positive experience with your brand. Essentially, your customers don’t want to be faced with a sales pitch when they’ve already bought from you. Use smart content to ensure your website is optimised so that existing customers aren’t shown CTAs or content meant for your prospects. Smart CTAs enable you to present specific content to a website visitor depending on their stage in the buying journey. 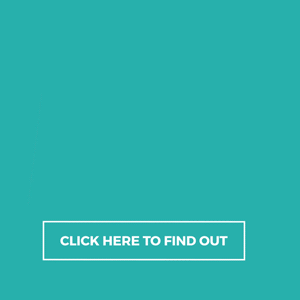 So, you’re probably wondering, what does your business have to gain from Inbound Marketing? 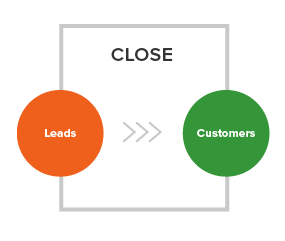 Patience is key with inbound marketing. While organic results can be slow to start off with, they will grow over time. Unlike outbound methods, inbound won’t stop performing the moment your budget does. An optimised blog post you write today will continue to drive traffic year on year. When executed well, inbound marketing can generate valuable leads in a more efficient, tangible manner than outbound tactics. The results of inbound are highly measurable, allowing marketers to easily demonstrate returns from the investment. The shift in buying behaviour in recent years urges businesses to react accordingly and adapt quickly to fast paced changes. How buyers obtain information and communicate has changed massively. Inbound marketing helps brands attract and retain customers who will refer and promote your brand.